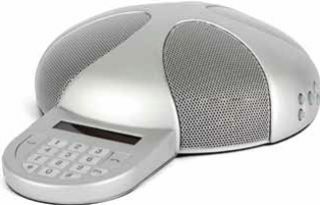 The Quattro3 (Q3) is a high-quality conference speakerphone designed to be used in combination with a computer, tablet, or smartphone. It is only 7” in diameter and weighs less than 2 pounds, making it highly portable for those that need to turn any room or classroom into a conference room. The Q3 utilizes multiple noisecancelling microphones paired with a solid speaker powered either by the computing device or the included power cord to provide excellent sound quality on both ends of the call. Quality and Effectiveness: I tested the Q3 with Skype, Google Hangouts, and attached to my smartphone and found it worked just as well as a traditional speakerphone in small or large rooms. Power can be drawn from the device, external power source, or an internal battery, making it possible to take the Q3 anywhere. The Q3 is a perfect all-purpose speakerphone that is effective in any setting. It is solid in construction and does not have much on it that could break, making it a perfect device to check out and take out anywhere in a school. Plus, it’s versatile and can be used with any number of mobile devices, including an iPad or tablet. Ease of Use: This is an easy enough device to use with a classroom computing device or smartphone to turn any room into a conference room. It connects through USB or a 3.5mm headphone jack, so anyone can set it up and use the technology with ease. It is a plug-and-play device that is intelligent enough to follow the conversation as it goes on in the room, so once it is connected there is nothing to think about. Creative Use of Technology: There are a couple of features that make the Q3 innovative. First, the flexibility to use nearly any device to facilitate a conference call makes this a great tool to have in any school. Plus the ability to add on multiple units to expand the reach of the call could be incredibly powerful. One could chain together up to 15 units (using an additional power source sold separately) and fill an enormous room with a close-knit conference experience. Suitability for Use in a School Environment: This would be a great device for bringing in guest speakers or hosting virtual fieldtrips via Skype or Google Hangouts. Usually attempts to bring virtual guests into a classroom are restricted by sound more than video and the Q3 eliminates the sound variables. The fact that you can use the Q3 to have a call and not have to hunt down a physical phone jack makes it perfect for schools where wireless internet is accessible. • Integrates with nearly any device. • Ease of use with common web-based communication tools. • Size and portability paired with expandability to meet the needs of any setting. OVERALL RATING: Overall, this is a solid device meant to fill the specific need of conference calls.